To say the least the Victoria Falls is awesome, mystic and astounding… At first sight it takes away your breath. And this has attracted the Toka-Leya people to the waterfalls. They have built shrines for their different deities for different solutions. Apparently they have lived contentedly. Take the Livingstone Island for instance. The people of Mukuni (Toka-Leya) buried their chiefs here. So the island of "Siloka" is sacred. And it is from here that Dr David Livingstone first saw the water cataract called "Mosi-Oa-Tunya" by the Kololo people who lived here in the 1800's. The Toka Leya of Chief Mukuni who now live here call it "Shungu Mutitima." There are many Victoria Falls rituals sites, shrines and sacred places in the surrounding area. The dimension of the Victoria Falls is 1,700m wide and is over 110 m deep. Of this width 1,200m is in Zambia and only 500 is in Zimbabwe. Within the mighty Victoria Falls there are many other waterfalls. As a result the face of the falls keep changing its shape along its width! How? The falls in the eastern end is called the Eastern Cataract. For the benefit of visitors a viewing point has been erected there. It’s from here that the most famous and classic pictures of the Victoria Falls are taken from Zambia. And just about midway towards the west there is a zone called the "Arm Chair" Falls because it is shaped like an arm-chair in your drawing room. Beyond that but slightly to the west of the entrance into the first gorge, and there nine of them down stream, is the "Horse Shoe" Falls because it looks like one. The Livingstone Island is west of the Horse Shoe Falls. The "Main" Falls is the area between the Livingstone Island and the western limit. And part of the Main Falls is in Zambia. So you have three falls in one larger Victoria Falls. Opposite the Main Falls the mist obliterates the view of the Victoria Falls – sorry Zimbabwe! Therefore, you get the best view from Zambia. That’s why visitors at Victoria Falls town in Zimbabwe always make a day trip to Zambia. At the Victoria Falls the water of the slow moving and wide Zambezi River cascades over the basalt rock cliffs and drops through more than 110m. As the "largest curtail of falling water" passes through the air it forms a mist that rises so high that is visible over forty kilometers away. This mist and the booming sound of the falling water is what is referred to as "the smoke that thunders." The mist is exactly like raindrops through which the sun’s rays form the ever-present rainbow. Now here is the mystery… The day light rainbow is exactly the same as the full moonlight rainbow: the colour scheme and the shape of the curvature are the same. But there ends the similarity! 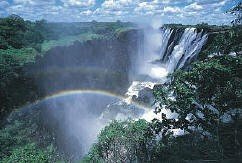 The day light (solar) rainbow appears to begin from the point above the Horse Shoe Falls and rises with a convex curvature towards Zambia and seem to end in the “rain forest” on the cliff opposite the Eastern Cataract. The moonlight (lunar) rainbow is the opposite. It seams to appear from the Arm Chair Falls and rises westwards to Zimbabwe. Wow! Now, why does the solar rainbow appear to drop in the east and the lunar rainbow points westwards? This question of opposing rainbows continues to puzzle many minds, and great minds at that. What phenomenon drives this mystery? And that is our mystery of the Victoria Falls Rainbows. Here is a funny story… an incidence actually, but not about rainbows. Some enthusiastic marketers installed electricity at the falls for ‘nocturnal’ viewing of the Victoria Falls. The National Heritage Conservation Commission (NHCC) dropped on them ‘like a ton of bricks.’ The Zambia National Tourist Board (ZNTB) hurriedly extinguished the electric lights. You see, the Victoria Falls is a natural corridor for elephants and other animals - the lights would have confused the largest land mammals. And who in their right mind would have wanted to watch the magnificent awe of the Victoria Falls at night? Who really?